Overview-How Can Champ Flush Out Detox Help You? One of the worst things about a job interview is being ambushed by a drug test. This particularly hurts the chances of recreational marijuana users getting hired. Being told on the spot that you need to submit a urine sample for drug testing when you were just doing drugs the previous night isn’t what a person wants to hear. Products like Champ Flush Out Detox might be able to help you pass your test in such a situation. If you find out that you may have to take a drug test a few days, or even a few hours, prior to having to submit a urine sample, you might be able to improve your odds of getting hired. Champ Flush Out Detox hasn’t been medically proven to be effective and has received mixed reviews. Nonetheless, if you’re stuck in a tight spot like the one mentioned above, it wouldn’t hurt to give Champ Flush Out Detox a try. Who knows? It might just end up resulting in you being hired. Needless to say, there’s no reason to worry about a drug test if you’re clean or on prescription meds. Just inform your employer if in fact you are on prescriptions and it should be okay. Champ Flush Out Detox has been around for over 30 years and is still in demand by some marijuana users. The detox drink claims to work not just with marijuana, but also with other drugs that are tested by a urine drug screen. This drink won’t actually detox your body by eliminating drugs completely. Rather, its ability to help you pass a drug test is through diluting your urine. It does this by increasing the amount of urine produced by your kidneys resulting in the concentration of drugs in your system becoming relatively negligible and thereby less likely to be detected. The fact is that Champ Flush Out Detox works by diluting your urine rather than having a cellular or chemical effect. This means that it’s nonspecific and will dilute anything in your urine that might get you in trouble. So, it’s not just for marijuana users, but anyone who uses drugs. Perhaps one of the best things about Champ Flush Out Detox is that it doesn’t contain unnecessary herbs and minerals. It just has the basics needed to get the job done with no extras. This is great, especially if you’re worried about the potential health risks associated with extraneous ingredients. Champ Flush Out Detox should work within 45 minutes. This makes it a good choice if you’re backed into a corner by having to take an unexpected drug test and losing all hope if getting the job you’re hoping for. There are multiple variations and flavors of Champ Flush Out Detox available. The one we are reviewing is the blueberry flavored variant, but you’ll find plenty of others like acai berry, lemon lime, orange-mango, grape and cranberry apple. Champ Flush Out Detox has the necessary ingredients to increase your urine output thereby diluting your urine sufficiently to get you through that unexpected drug test. So what does each of these do? The riboflavin is important in order to keep the color of your urine yellow. With dilution and frequent urination, the color of your urine can become almost transparent making it obvious that it has been diluted. Riboflavin makes sure that this doesn’t happen. Creatine is added because urine naturally has creatine. However, diluted urine has very little of it. By adding creatine, you’ll keep its concentration close to normal in the urine so test results don’t show that your urine has been diluted. Guarana extract works like caffeine by increasing your urine output; while the Echinacea extract works as a mild detoxifier. Minimum 48 hours before using Champ Flush Out Detox drink, you must STOP using marijuana. The longer you refrain from using marijuana, the easier it is to mask the toxin in your urine. Urinate a couple of times before actual urine test. If you want to be sure of your drug test results, take a home urine drug test. 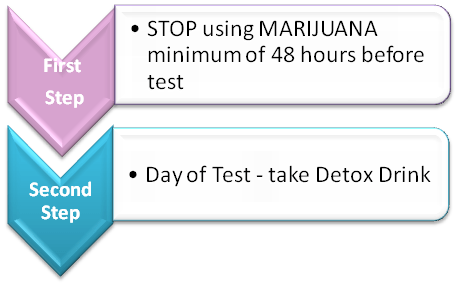 If you know about the drug test well beforehand, abstain from taking drugs at least 2 days before the test. Ask your doctor before using Champ Flush Out Detox if it’s safe for you in order to avoid any potential side effects. It has the ingredients needed to increase diuresis and dilute your urine without adding unnecessary products that could hurt your liver and/or kidneys. Cheaper than many other such detox drinks. Adds color to your urine through riboflavin to prevent your urine being too transparent. Added creatine ensures that creatine levels in your sample aren’t suspicious. Comes in a variety of flavors, including blueberry and lemon lime. It hasn’t worked for many people, so it might let you down. Despite adding creatine, lab tests can sometimes detect when urine has been intentionally diluted. There’s not much information online about the detox drink and medical studies haven’t confirmed its safety. For any assistance regarding Champ Flush Out Detox, contact www.amazon.com using email, phone, or online chat. They’ll be able to provide you with the assistance you need and answer any questions you may have. Champ Flush Out Detox has been around for a long time, helping users pass their drug test in order to be hired. Though it hasn’t worked for everyone, there is still constant demand for the drink from marijuana users. It works by diluting your urine making drug levels less detectable. The drink contains riboflavin and creatine to minimize the risk of detection of drugs. It works in 45 minutes, which is great. This should be enough time to be effective. Just make sure you drink plenty of water and urinate a couple of times before the urine test and check your urine with a home urine drug test before your actual test. If you are on a tight budget and prefer using detox drinks instead of home remedies, you might consider using Champ Flush Out Detox drink. Hope you found our Champ Flush Out Detox review useful. If you’ve tried detoxing using Champ Flush Out, let us know more in the comments section so that others can gain and benefit from your valuable experience.